My apologies for the break. I’m starting to feel a little bit more inspired as of late, though please don’t be too devastated if I end up back on another mini-hiatus. What I do want to come clean about before we go any further is that I’d like to pair my posts down to twice a week. When I first started experimenting with this blog more than a year ago, a Tuesday and Friday schedule felt like it was the right way to go. I would spend one day every week focusing on present-day Spider-Man, and one day focusing on my collection’s past. Then, last summer’s Spider Island event flooded the market with Spidey-centric content. 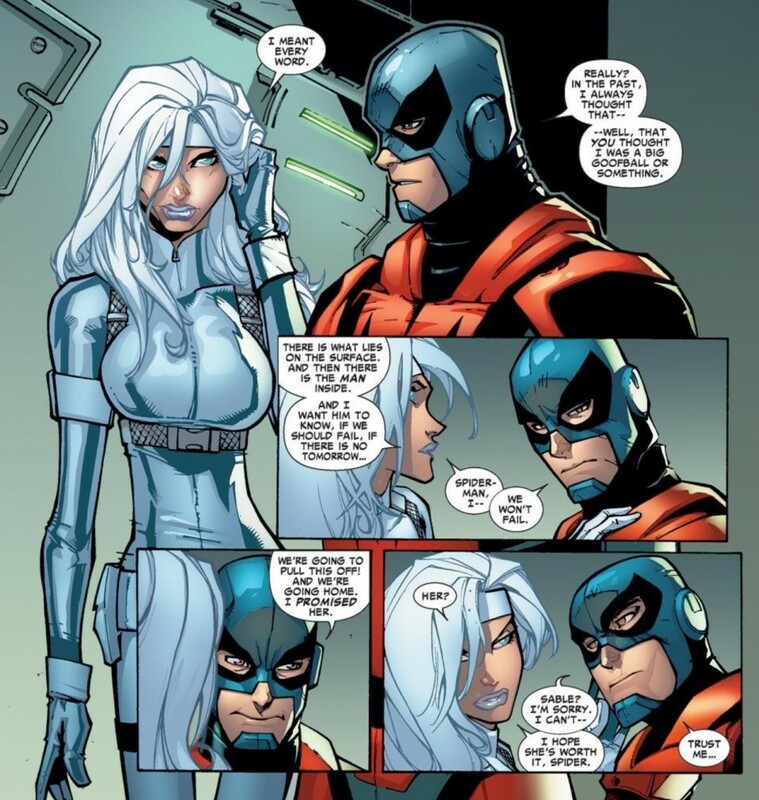 Avenging Spider-Man and Scarlet Spider debuted. 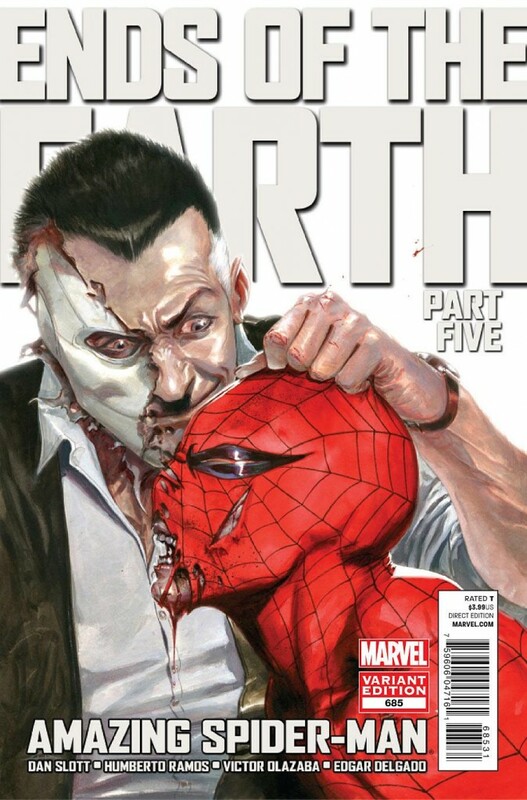 There were relevant mini-series like Carnage USA, and Rick Remender was doing some awesome things with another character from the Spider-verse in Venom. There was too much “new” going on, I just didn’t have the wherewithal to read it, digest it, and come up with some interesting things to say about it three, four, five times a week. Meanwhile, the birth of my son has slowed down my quest considerably. As I’ve said before, I will complete this quest, but it just feels like such a low priority at this point. The quest was the entire premise for this blog – what essentially set it apart from any other comic book-centric fan site out there. This site was more about a person than a comic book character, or at least that person’s connection to a comic book character. I felt all of these diversions and distractions made me lose sight of Chasing Amazing’s original thesis – one man’s quest for every issue of Amazing Spider-Man. While the quest is indefinitely on slow-motion, I really do want to get back to this being a tale of collecting first, and Spider-Man second. If I don’t have something entirely insightful to say about a comic book, new or old, I’m not going to. Or, at least I hope I don’t. I guess you are all the judges of that. 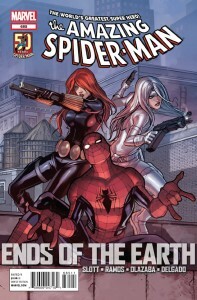 Trust me, I’m still going to share my thoughts and impressions about some of the new stuff being churned out by Marvel: Ends of the Earth, Spider-Men, the 50th Anniversary celebration this summer, and of course the anticipated issue #700 which has already been prefaced with some ominous overtones by writer Dan Slott. And I will still reflect on the comic books that are already in my collection, how I acquired them, what they meant to me, what they mean to me now … I guess what I’ve spent three paragraphs saying is, I hope in the case of Chasing Amazing, that less is ultimately more. So … Ends of the Earth … right? OK, if I remove my fanboy sunglasses and read this series totally objectively, I have to admit, I’m a bit disappointed so far. As this thing was kicking off a few months ago, I had high hopes that this would be 2012’s answer to last year’s successful Spider Island arc. There was a lot to be excited about: the return of one of Spidey’s greatest foes in Doctor Octopus. 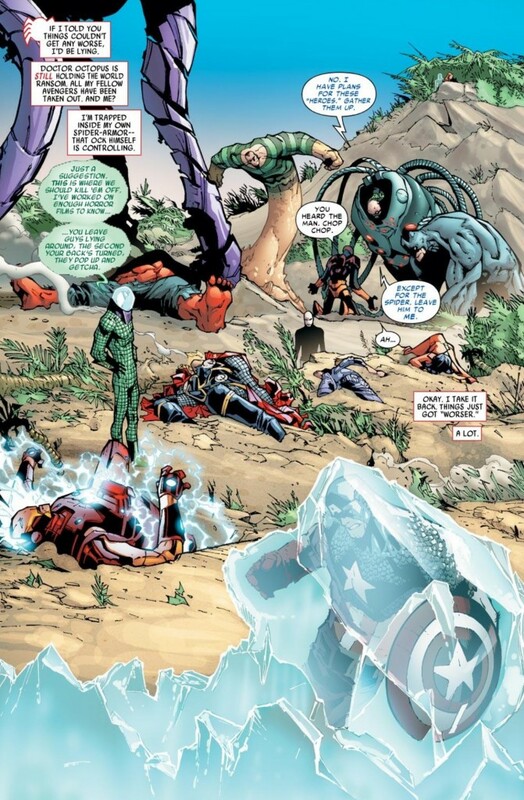 The defeat of the Avengers which meant Spidey was going to have to succeed on his own. Stakes that are, on paper, even higher than those put forward by Slott and company in Spider Island. My biggest gripe with how the whole thing has played out so far is that after spending more than a year and change establishing Spider/Peter Parker as a special, unique hero in the Marvel universe that warrants adulation, not scorn, Slott is leaning too heavily on the part of the Spider-Man mythology that plants the Web Spinner firmly in the “loveable loser” camp. 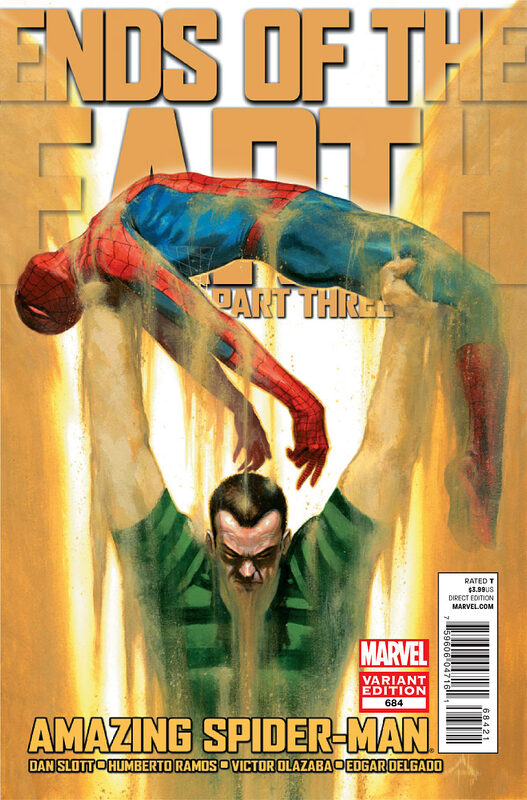 In each of these issues, the merits of Spider-Man’s leadership comes into question. 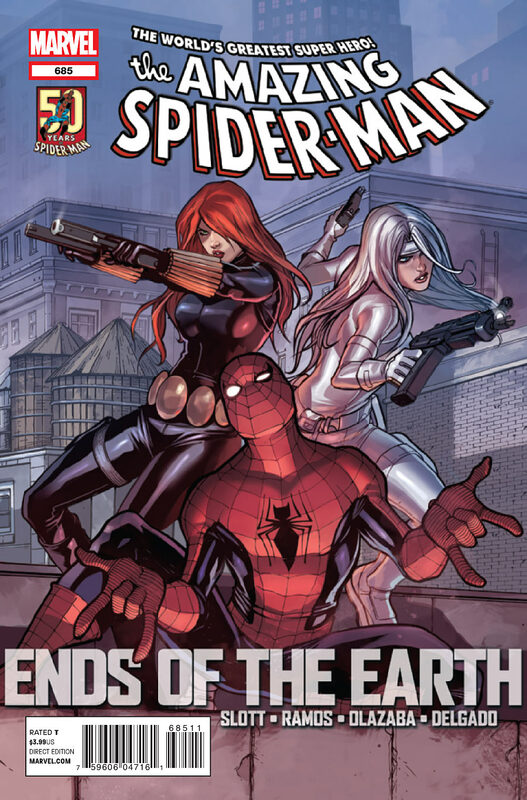 With the Avengers defeated by the Sinister Six, Spidey is left leading a rag-tag group of Marvel B and C-listers like Black Widow, Silver Sable, Union Jack, Kangaroo, etc. 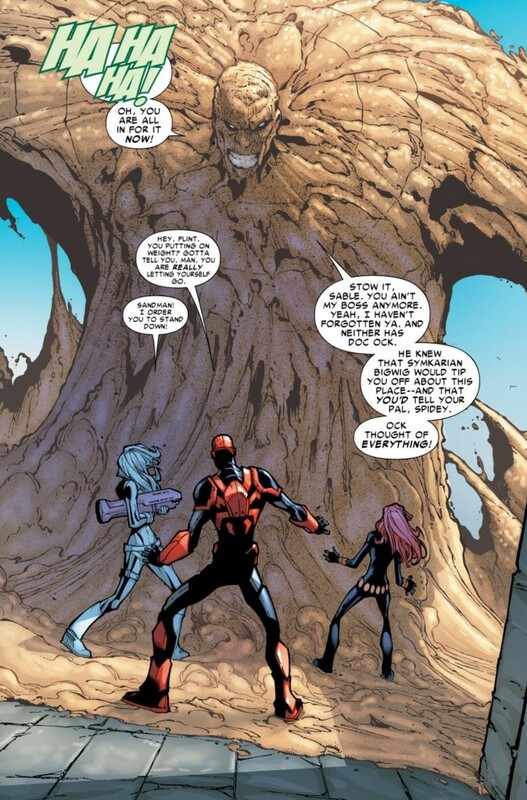 There’s the inevitable, “I’m not a leader” type of dramatic dialogue from Spidey, with his colleagues trying to convince him otherwise – that he DOES have the wisdom and power to defeat Ock once and for all. And this would all be well and good if one of the closing images of the Spider Island arc was Spider-Man/Peter saving New York City and owning the moment. Spidey is dispirited when he fails to get the credit he deserves at the end of that storyline. He’s not questioning whether or not he has the wherewithal to pull it off. The guy has been a superhero for 50 years. If he doesn’t realize at this point that he’s pretty damn special, than I’m starting to believe this guy is just trolling for sympathy. We get it – you’ll never be as beloved as Captain America or Iron Man, but you’re still the Amazing Spider-Man. Stop being some mealy-mouthed about it and finish of the Sinister Six. Hell, there are about a half-dozen instances in your own comic book series of you dispatching them without any help at all. You can do it again. Yes, I understand that dramatic tension always makes for better storytelling, but I’m tired of the hero I love and adore continuously being treated as some kind of second-rate character by his own creative team. A decade before the Avengers and Batman were breaking box office records, the original Spider-Man movie was the toast of the town. The general public accepts Spider-Man as probably the most recognizable of all of Marvel’s characters. Maybe it’s time to stop making excuses for the guy and just let him have a bit of a chip on his shoulder and an ego. Am I really supposed to be excited by the fact that Spidey is leading an entourage of international heroes, many of which I’m wagering the general public has never even heard of? You can’t even blow the dust off of Cloak and Dagger and bring them into this storyline and at least give Spider-Man fans some characters that already can relate to? To use a sports analogy, I’m tired of Marvel treating Spider-Man like the Chicago Cubs of their universe. Yeah, they’re the loveable losers of baseball and who’s heart didn’t break for the Cubbies when they collapsed in the playoffs in 2003? The problem with this logic is, when you think long and hard about it, despite the randomness of baseball, it’s quite pathetic that the Cubs haven’t won a World Series since 1908. What do we need to love a loser? I’m not saying that Marvel should treat Spider-Man like the New York Yankees here, but how about a highly-respected historic franchise like the St. Louis Cardinals, or based on their success from the past decade the Boston Red Sox (as a Mets fan, it kills me not to include them, but I guess that analogy is reserved more for a character like Hawkeye or Nightcrawler – characters that have been a part of some great moments in history, but lack distinction in the grand scheme of things). Perhaps the root of this frustration comes from the fact that I can’t think of a writer who has “gotten” Spider-Man better in recent memory than Dan Slott. He understands that nuance and I suspect he’ll get things back on track as this arc is resolved. But considering my expectations coming in, it’s hard not to be underwhelmed, and that starts with the creative team leading me to believe I’m rooting for an underwhelming character. Never a wise trick in my opinion. I just started reading RIGHT when you left. Good to see you back. I do feel like they don’t give Spidey enough credit. He has made AT LEAST 1/4 of Marvel’s profit, yet they treat him like dirt. He BARELY appears in the Avengers comics, though he is one. I like End of the Earth so far, and I think it really picked upfrom last issue. His role in the Avengers remains a mystery to me, and to be honest, I rarely read the Avengers anymore as a result. Ditto with Fantastic Four. I’ll be curious to see what Bendis does with Spider-Men since I think he’s one of the culprits of downgrading Spidey’s stock over the years.